There is a whole lot of shaking going on in Tres Pinos in these days. Well, it is not exactly the earth shattering rumbling associated with big earthqakes. But the 500 or so residents of this tiny hamlet south of Hollister have certainly been taking note. Joe Lucido tells the blogger: "We felt quite a bit of shaking last night...The last couple of weeks have been like nothing we can remember here in San Benito County. The talk is all over town." So what is going on in this section of the state, about one hour's drive south from Silicon Valley? Tres Pinos is located between Hollister and the Pinnacles. In the immediate vicinity of this town, the Calaveras Fault branches off from the San Andreas Fault. South of the split, the section of the San Andreas is "creeping" all the way to Parkfield. Creeping means that the mechanical stress associated with the movement of the plates is not stored in the rock until it breaks in a big temblor. Instead the energy is more or less continuously released. You can see evidence of this creep in the pavement of Highway 25 south of Tres Pinos. The fault crosses the road in many places. 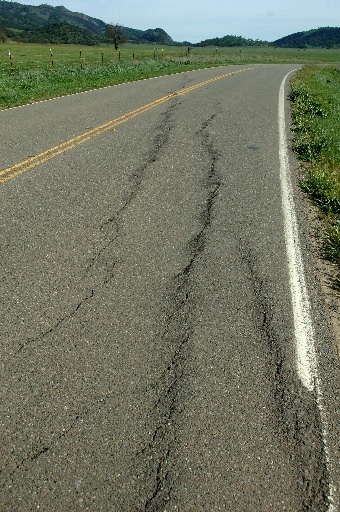 There, the asphalt is broken in a typical, staggered pattern that seismologists call "en echelon cracks" (see picture). However, not all of the energy is released in fault creep. Sometimes the friction between the two flanks of the fault is too high and some energy accumulates. When the rocks crack under this load, earthquakes happen. These quakes with magnitudes of 3 or 4 are small by worldwide standards, but strong enough to be felt. Even though the movement of the plates - and thereby the transfer of the mechanical stress into the fault - is very steady, friction along the fault is not nearly as constant. This is the reason that small temblors sometimes occur in clusters. If there are enough of them, they begin to rattle the nerves of the folk in Tres Pinos and nearby.